It’s no secret that a sales team’s biggest strength can also be its greatest weakness: Your top business development reps — the team members who are able to cultivate powerful relationships, close deals and truly be “in the moment” — are struggling with major information overload. Finding a balance can bring you to sales team success. The solution, however, goes back to the basics. Before committing to any new processes or software, sales leaders must take a step back to start with the following framework that will help guide them to sales team success. What distinguishes a great sales team from a good one? Steve W. Martin, a sales strategy professor at the University of Southern California Marshall School of Business, recently explored this question in an analysis of 200 businesses. What he found is that the best B2B sales organizations share common success-defining characteristics — all built upon a strong, centralized sales culture. 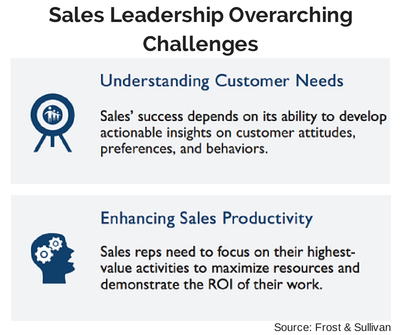 “There is no single greater influence over the success of the sales organization than how the sales leadership creates the sales culture and environment for the people who will work for them,” Martin wrote for Harvard Business Review. Exercise control and dictate direction, but give team members the space, autonomy, and flexibility to achieve goals by utilizing their own strengths. Tie team members’ performance to specific revenue goals. Encourage competition by sharing performance data, but maintain cohesion by giving team members their own sales territories to manage. Encourage a DIY attitude by encouraging sales reps to spearhead new initiatives and self-direct their success. Maintain high energy levels by encouraging sales teams to support one another and operate as a team. This kind of morale inspires sales team success. What’s the one resource you can’t borrow, invest, or recover? 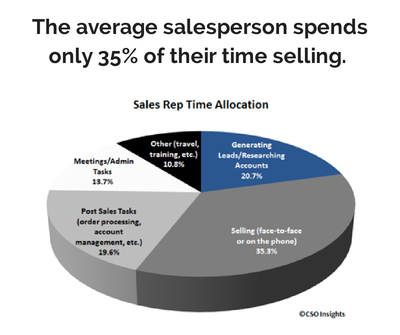 Time is a business’s most valuable asset — especially for sales reps who are constantly pursuing new opportunities and closing deals. The problem is that while some sales reps have great time management skills, others need a bit more direction. Individualizing time management creates an uneven playing field, which can cause equally talented sales reps to operate at drastically different paces. In a survey of 1,500 executives, McKinsey found that only 9% of the respondents deemed themselves ‘very satisfied’ with their current time management allocation. Nearly half admitted that they didn’t have enough time left over in the day to focus on strategic priorities. These trends, starting with an organization’s leaders, will ultimately trickle down to every single employee. CRMs, project management, chat software, and time tracking tools need to be evaluated at the organizational — rather than individual — level. In other words, “time management” should not be a goal on your reps’ performance plans. Build systems to support them instead. A recent report from Bain & Company explains that for decades, sales economies have been operating at maximum efficiency. In the last decade, however, that trend has reversed, with diminishing profit margins. Bain attributes this trend to rising customer demands. Buyers are increasingly looking for custom-tailored solutions and higher levels of guidance. In addition, customers are less willing to sign long-term contracts with vendors. “In turn, these shifts in demand have caused companies to dramatically change what they sell,” explains the Bain report. Organizations are investing in consultative selling practices, creating sales “packages” that weave together multiple solutions for customers, and piecing together multiproduct packages that support customization. Bain explains that compensation schemes should be adjusted — and simplified — to support these models. Reward star performers, encourage learning, promote cross-selling, and generate repeat revenue through existing customers. Step 4: Check out Yesware for Teams to stop guessing & start growing. Workflows need to complement existing processes — which means that you shouldn’t try to fit a square peg in a round hole. Your team is an invaluable resource for defining the processes, technologies and tools that you’ll need to achieve sales team success. Always test before making final decisions, and work with your team to collect feedback and provide recommendations. This feedback loop will be crucial for creating a system that works. Hungry for more? Learn about consultative selling from our CEO & the President of RAIN Group.